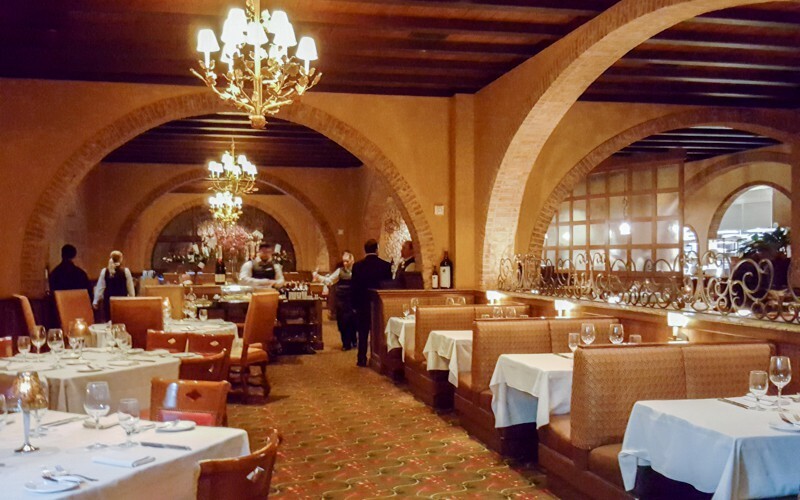 A recent trip to Texas for a conference led me to discovering the charming town of Grapevine and a beautiful hotel that I had to share with you. The Gaylord Texan is one of the signature Gaylord Hotels that Marriott owns and operates as their convention center flagship hotels. But don’t let the convention center title fool you, this resort is designed to offer it’s guests an all-in-one approach for their stay. From their restaurants to their spa, you’ll truly experience a taste of southern hospitality and down-home luxury. With an imposing footprint, and over 1,500 guest rooms, you’ll definitely understand the meaning of “everything’s bigger in Texas”. The Gaylord Texan Resort is divided into 3 unique atriums areas, the Lone Star, Hill Country, and Riverwalk. Along with these unique regions, the resort also boasts 400,000 square feet of meeting space, and a waterpark complex. The resort has just started an expansion plan which will add 303 guest room and 86,000 square feet of carpeted meeting space. The dining at the Gaylord Texan is world-class. Six awesome dining experiences, all with a unique style and unbelievable food. I was able to try out all of them, and can tell you that your belly is in for a treat. This is a Gaylord signature restaurant, and serves delicious Black Angus beef. The restaurant is decorated in a formal country manor style, and the wait staff are superb. If you’re a wine lover, definitely start your night out in the Old Hickory Wine Bar. The Wine Bar uses a Enomatic wine storage system that allows you to sample world class wines, plus the sommeliers are very knowledgeable and can help choose the best varietal for your palate. Zeppole is a fabulous dining restaurant in the heart of the Hill Country Atrium, featuring an open air seating style. The food here is heavily influenced by the fresh, coastal cuisine of Italy. The chef has free reign in the kitchen and the menu features unique recipe creations. This sports loving girl fell in LOVE with the Texan Station restaurant. It could also have something to do with the amazing food, I especially fell in love with the Frito Pie that we had for a trial taste test! You absolutely must order the caramel apple empanadas for dessert. Oh my! If you love watching sports, any sports, this is the place to go. They have a 52 FOOT screen that features a few main games, as well as individual screens all around the dining room airing other sports. Here is where you can feed your craving for true Tex-Mex food. The Riverwalk Cantina is also an open space dining area, designed to make you feel like you’re in the famed Riverwalk of San Antonio. This is a must-do in my opinion. Order one of their specialty cocktails and some of their signature queso, then sit back and take in the sights and sounds of the riverwalk atrium. If you love breakfast, the Riverwalk Cantina also features an amazing breakfast buffet. This is a restaurant designed for coffee-addicts. 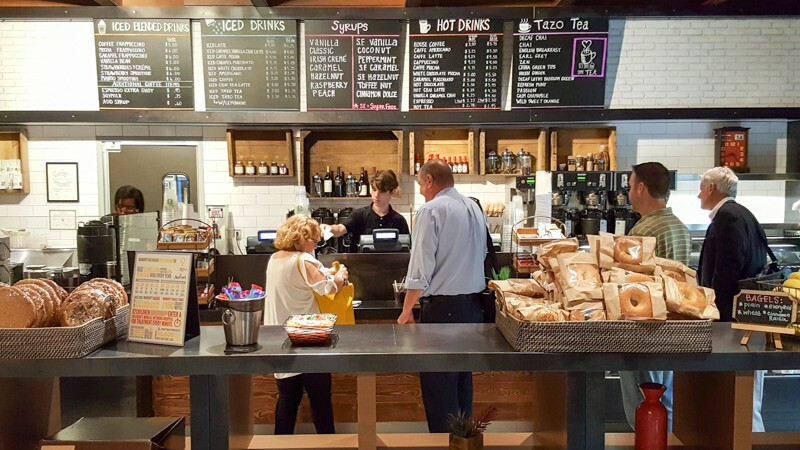 The Mission Plaza Marketplace is where you can get your fancy espresso drinks, as well as grab and go breakfast and lunch items. There’s also another coffee shop cafe right across called the hall called the Cocoa Bean Express. When you’re ready to party, The Glass Cactus is where you want to head. It’s the club joint at the Gaylord Texan, and evidently it’s one of the Dallas Cowboy’s favorite party venues. Here you can grab cocktails and club fare food while dancing, or chatting outside on their open air deck. As you’d expect from any luxury resort, the Gaylord Texan spa, Relâche, is delightful and relaxing. Along with offering pampering treatments, the spa also features relaxation spaces including a darkened slumber room. Definitely give yourself some time before and after your treatment appointment so you can sip some of the infused water while you relax and rejuvenate. The facilities at Relâche Spa are very welcoming and clean. They offer individual lockers, robes and slippers, plus vanity products for you to use in the shower and for freshening up after your treatment. And after your treatments, be sure to stop in the spa shop to stock up on some of their amazing skin care products. The salt scrubs are amazing! 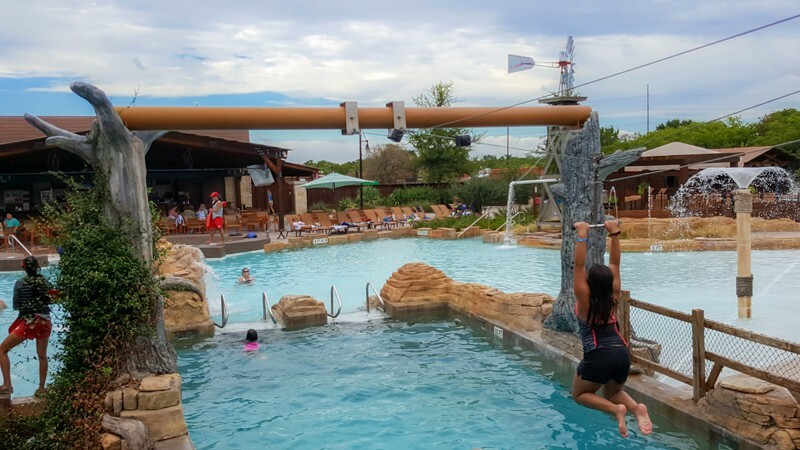 One last feature of luxury at the Gaylord Texan Resort are the pools. There is a pool just off the Hill Country Atrium that has a beautiful waterfall, and is very convenient for a quick dip. But the gem for the Gaylord Texan is their waterpark complex that is a short shuttle ride away. The waterpark is every kids’ definition of luxury, and for parents, there are cabanas available for rental. 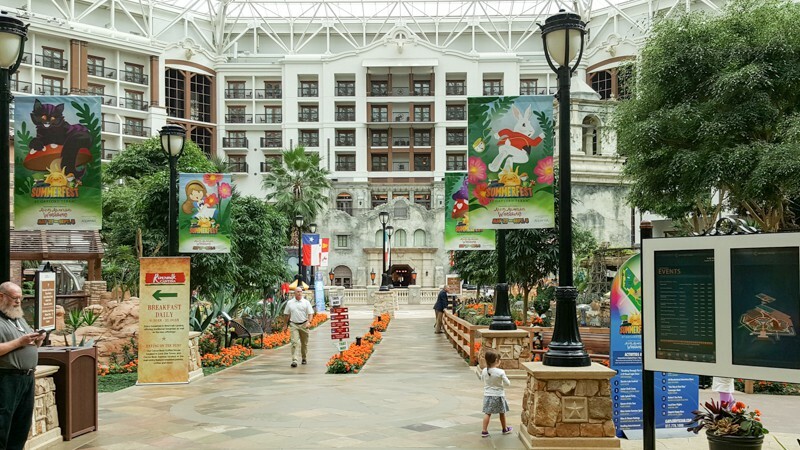 Staying at the Gaylord Texan Resort truly gave me a sense of down-home comfort and luxury. If you’re heading to the Dallas area, I highly recommend planning a stay. The Gaylord Texan would be a great spot to stay for a weekend getaway from Dallas. And remember if you’re planning to fly into Dallas for your luxury resort escape, Southwest Airlines is based out of Dallas Love Field. The Gaylord Texan offers shuttle services to and from Love Field, making transportation a breeze. Southwest Airlines also let’s your bags fly for free, so no worries about getting your souvenirs back home! My stay at the Gaylord Texan was a complimentary component of attending the conference. All thoughts and opinions are my own based on my experience. I think that sounds like a great plan Dana! Wow! What an awesome place to stay. The food looked and sounded amazing and I love how each restaurant had its own unique look. And that Pool! This would be a great place to take my family for a vacation! It is perfect for families Bryanna! They have a lot of fun family programs, too! Now that I have kids, places like this leap off the page and into my “go to” list. So fun!